"I want you to know that these projects are changing lives!" As a woman, a mother, a female CEO and a survivor of sexual abuse, I am passionate about raising funds and awareness to fight human trafficking. 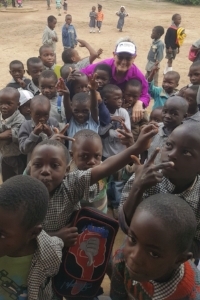 In February 2018, that passion and commitment was elevated to an even higher level when I, along with four other women, visited four Operation Mobilization (OM) projects that Freedom Challenge supports in Kabwe, Zambia. In case you don’t read any further, I want to make sure you know that I’ve witnessed first-hand how these projects are changing lives! The funds you give and your participation in Freedom Challenge events raises money that meets the immediate needs of women and children in desperate situations, but even more importantly, OM is providing skills, training and education that will allow them to build a better future. If you are considering participating in or donating to a future Freedom Challenge event, let me encourage you to DO IT! Our first stop was Bethesda Mercy Ministry. Here, we met the husband and wife team from Zambia that oversee this program, Henry and Brenda. They shared that the disabled were an unreached group. They are rejected by society, the parents feel shame and the father often abandons the mother and child, leaving them destitute and poor. Bethesda’s mission is to provide daycare and education for disabled children from toddlers up to 21 years of age, in the hope they can live an independent life. They also help the mothers develop a business plan to earn a living. We went to the various classrooms to meet the teachers, volunteers and children. We saw children that were crippled, wearing leg braces, on crutches and in wheelchairs. Some had Down's Syndrome. The amazing thing is that many of the children were so full of joy. One class sang for us. The class for the older group (18 – 21), was learning life and social skills like personal hygiene, being on time, and how to be a good worker. One little girl that captured my heart was deaf. Her name was Deborah. 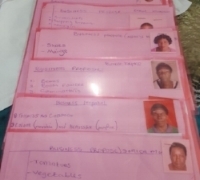 We met ten of the mothers of the disabled group who shared their one-page business proposals. Most plans involved the selling of vegetables, charcoal, cooking oil, etc. These women were given a $4 loan from OM to start their business. Our next stop was Mercy House. It is located in the poorest community in Kabwe called Makululu. The OM missionary that runs Mercy House is from Scotland, and her name is Ann. Mercy House provides the $40 it costs for a school uniform, which allows a child to attend public school for a year. The kids go to Mercy House after school and are provided a meal and Bible teaching. Most of the kids in Mercy House are being raised by a single mom or a grandmother. We met one mother who was 21 years old with 3 children; her oldest was 11 years old. Do the math! Mercy House also has a program where the mothers can learn how to sew, so that they can make money. Bernadette from Zambia teaches the program. She received her training from another OM program supported by Freedom Challenge called Tabitha Skills Development. We also met 37-year-old Pharen, who is the leader of the Tabitha Project. She shared her story of becoming an orphan at age 14, the hardships she endured and how God took care of her. The pain and hurt she suffered inspired her to want to help other women, so the Tabitha Project seeks to empower vulnerable women by teaching them skills and mentoring them. They learn to sew, knit, crochet and make beaded jewelry. The leaders of the Tabitha Project are committed to expanding their efforts to reach more women in the community. During our trip, we saw a new building under construction that will facilitate this, and we also met two other young women that were being developed as leaders so that they could go out to other Zambian villages and teach more women the skills to make a living. The last project we visited was the Makwati Community School, which offers elementary school classes. Here, we spent time with the Principal, visited several of the classes and talked with many of the teachers. We enjoyed having recess with the kids and interacting with them. Next to the school was a field planted with sweet potatoes that we learned was purchased with Freedom Challenge funds. The sweet potatoes are sold to raise money to support the school. Isn’t that a perfect example of your donations being used for real-world, sustainable solutions? In the OM house we stayed in hung this very simple sign: “Beloved is your deepest and truest identity.” For me, this sign sums up what OM projects are accomplishing. These projects are showing the oppressed and vulnerable women and children of the world that they have value, they matter, and that in God’s plans, they have hope and a future, thanks to the time, talent and treasure of people like you! Ginger’s passion for fighting against human trafficking has led her on a mountain climbing journey with The Freedom Challenge since 2014. With five climbs under her belt thus far, including 7-Summits Colorado 2014, Mt. Kilimanjaro - Africa 2015, Grand Tetons - Wyoming 2016, Estes Park - Colorado 2017, and Machu Picchu - Peru 2017, Ginger has tirelessly raised funds and awareness for the women and children who are victims of human trafficking. As a result, Ginger has been asked to speak to a multitude of different groups throughout South Florida to tell her story of climbing Mt. Kilimanjaro and the leadership lessons learned along the way.